Why Gucci's Swing Leather Tote Is An Instant Classic | Gina Miller's Blog - A working mom's blog about fitness, travel, handbags & beauty. Press play to watch my unboxing video. Can we talk about Gucci's Swing Leather Tote? I love it. Gucci has created the perfect bag for working women, students or über-moms who need to haul diapers, snacks, wipes and sippy cups yet still want to look stylish. This instant classic rivals the Louis Vuitton Neverfull as the new carryall du jour because it is chic, elegant and functional. Watch my original unboxing video as well as my "How's It Holding Up?" updated version to find out why I love it so much. The Swing Leather collection has been popular for Gucci. The Italian house has updated the bag and added a small name tag to the original design of it. The Swing Leather collection also features wallets, wristlets, crossbody/WOC bags and children's totes. The tote comes in two sizes: medium and small. The medium version (the one I have) comes in a variety color options and measures 13.4"W x 12"H x 7"D with an 8.6" strap drop, similar in size to the Louis Vuitton Neverfull MM (or medium size). It features two interior pockets which can hold a cell phone, pens, notebook, etc. 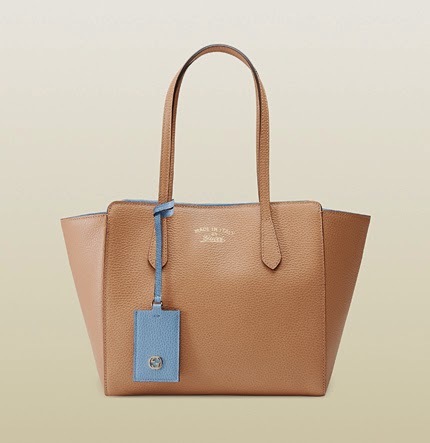 It also has an interior zipper pocket which Gucci says can "fit an iPad." It does. Sold. The small version also features a variety of color options while measuring 10.6"W x 9.5"H x 6.3"D with an 8" strap drop, similar in size to the smaller Louis Vuitton Neverfull. This roomy bag can also hold a lot. 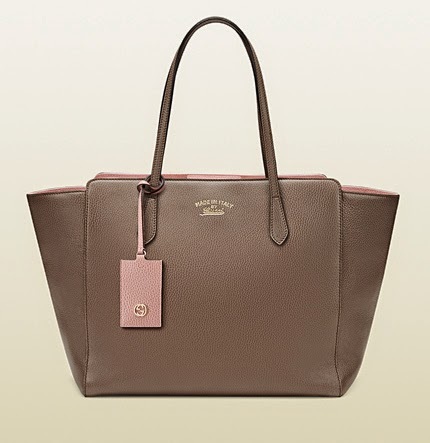 UPDATE: As of 5/8/15, Fashionphile has two Gucci Swing Leather Totes on sale red and pink. If you want one, hurry! These go quickly. At $1000 for the small and $1350 for the medium, these bags are investment pieces. 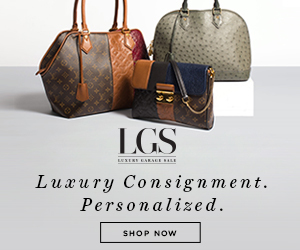 I believe they are a better value than the Louis Vuitton Neverfull for two reasons: the generous interior pockets and the beautiful, supple leather construction. (Tweet this). The Neverfull is simply monogrammed canvas and starts at $1180 for the smallest version. If you do invest in one of these, I feel it's a wise one. They are timeless classics you can carry for years. If you do tire of them, you can always consign or resell them and get a portion of your money back. My Louis Vuitton Neverfull practically paid for itself.